“New York Reload” describes drawing a second gun in preference to reloading the first under fire. While tshirts describing the concept are available, the practice itself isn’t. NYC remains one of the most restrictive jurisdictions in regards to carry or mere ownership of guns, possibly more restrictive than the UK. Back in traditional America, that practice is alive and well. 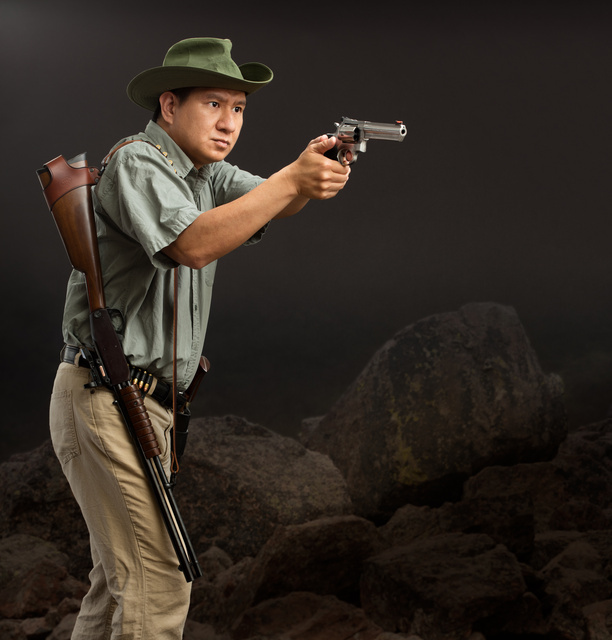 Albert, the pistolero pictured, is a great fan of “cowboy logistics”, using the same cartridge for both handgun and carbine. Between the 9+1 of the .357 Timberwolf pump and the additional six of the Ruger GP100, he’s decently equipped to deal with most raptor and xenomorph infestations. Quite a few shoots like this concept. This entry was posted in ammunition, pistol, rifle, weapon and tagged 357Mag. Bookmark the permalink. The NY reload still makes a lot of sense. I often carry revolvers, and a second handgun is much more likely to be fumble-free than trying to reload with a speedloader or Speed Strip, or, (horror!) loose rounds. Multiple handguns are also a better solution to a jam or malfunction in a revolver. Revolver malfs don’t happen often, but they generally can’t be fixed during a fight for your life. Re: one cartridge for multiple guns: Yes, a lot of us like the concept. The cowboy logistics idea also works for range trips, so I only have to grab one type for multiple firearms. 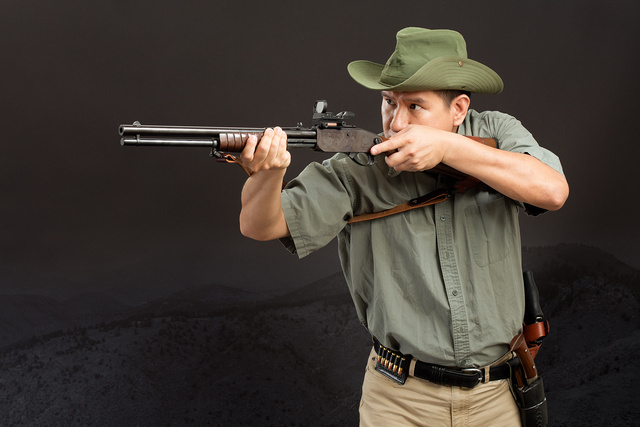 The .357 Magnum is a fantastic cartridge for both revolver and carbine. Yeh , that was a great concept in 1875, and for a survival situation it still is. You just have to bear in mind that the pistol ammo needed to run that concept is not going to be a “one shot man killer” and will be worthless Vs. body armor. Having said THAT. For states with rabid anti-self defense laws it is a good “work around”. If I had to run that I think I’d go with .30 carbine. It provides MUCH greater penetration , velocity, and energy transfer than any pistol round with the exception of one. The 7.63 Tokorev.